In the first week after the holiday, 57 shares faced lifting of the ban, and the total market value of the ban was 102.8 billion yuan, of which 11 shares were released from the market value of over 3 billion yuan. In the first week of the Year of the Pig, the A-share market will be lifted to a large scale. According to statistics, the number of shares banned in the first week after the Spring Festival totaled 57, and the total number of banned shares reached 10.99 billion shares. The latest closing price was calculated, and the total market value of the ban was 102.8 billion yuan. Putting it all year round, in 2019, the market value of the ban was over 100 billion yuan in 9 weeks. 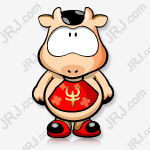 Since the first week of the pig year, the next week of lifting the ban on the market value of 100 billion yuan is the third week of April. 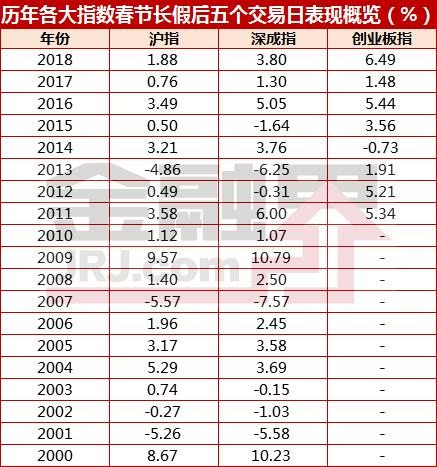 From the stock market,In the first week of the Year of the Pig, 5 shares were released and the market value of the ban was over 5 billion yuan.Nutrient drink,Huaxi Securities,Century Huatong,North Bay Harbor,Oriental fashion. The highest market value for lifting the ban is the nourishing drinks. On February 12, a total of 396 million restricted shares of Yangyuan Beverages were listed for circulation, and the market value of the ban was 16.256 billion yuan. The banned shares were the initial shareholder restricted shares and the initial institutional placement shares. Followed by Huaxi Securities, the market value of the lifting of the ban was 10.99 billion yuan.. On the first trading day of the Year of the Pig, Huaxi Securities will have 1.253 billion shares banned, and the type of banned shares will be the original shareholder restricted shares. On the same day, Century Huatong will also lift ban on 363 million shares of private placement institutions. The market value of the lifting of the ban will be 7.217 billion yuan, and the market value of lifting the ban will rank third. In addition, Beibu Gulf Port and Oriental Fashion have lifted the market value of over 5 billion yuan.East China Medicine,Deep sky horse A,HuatieThe market value of the 6-share ban is over 3 billion yuan. The market value of 5 shares banned is less than 50 million yuan, respectivelyShenghong Technology,Jida Communication,Chuanheng shares,Tongtong Technology,Yongan Pharmaceutical. Shenghong Technology has the lowest market value, and the market value of the lifting of the ban is less than 10 million yuan. On February 12, Jida Communications will face 2 million shares facing the lifting of the ban, and the market value of the lifting of the ban will be about 25 million yuan. The lifting of the ban is the initial distribution of the original shareholder's restricted shares. In addition to lifting the market value, the ratio of the ban on stocks will have different degrees of impact on stock prices. Data treasure statistics show that 13 stocks banned shares accounted for more than 30% of the total share capital, including Oriental Fashion, China Railway,Haishun new material,Yuetai SharesWait.The highest rate of lifting the ban is the oriental fashionNext week, there will be 423 million shares banned, and the number of banned shares will reach 71.96% of the total share capital. 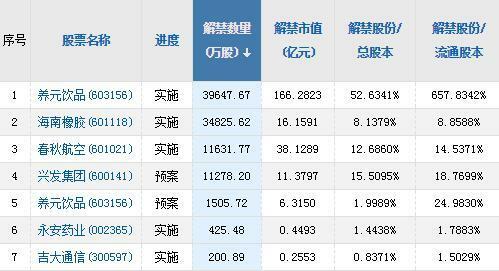 China Railway's banned shares accounted for 63.24% of the total share capital, after the Oriental fashion.Haishun TechnologyThere will be 65 million shares listed for circulation next week, and the total share capital of the banned shares will be 62.12%. In addition,Beibu Gulf Port, Yangyuan DrinkThe rate of lifting the ban is also higher, both above 50%. Among them, Yangyuan Beverage is the second-time new stock listed last year, and the sub-new shares listed last year are facing the lifting of the ban.Yujiahui,Nanjing Julong,Jiayou InternationalWait. After the release of the ban stocks,Xishui,COSCO Hai Te,Guangdong Yutai,Everbright GarboWaiting for 10 shares of the listed shares to reach full circulation,Western entrepreneurship, Yuetai shares,Spring AirlinesAfter the release of the banned shares and the circulation of the banned shares next week, the listed shares will be close to full circulation. At present, the disclosure of the performance of the Shanghai and Shenzhen stock markets has come to an end. Data statistics show that 43 of the 57 stocks released next week disclosed the performance forecast, and one disclosed the performance report. Some stocks performed well, with the median expected change in net profit,赣能股份,I love my home,Fenghua Hi-Tech,Yisheng shares14 shares of 2018 net profit are expected to increase by more than 50%. The largest increase is expected to be the share of the company.The company expects the net profit attributable to shareholders of listed companies to be 166 million yuan to 215 million yuan in 2018, an increase of 9.09 times to 12.07 times over the same period of last year; I love my family in second place, and it is expected that the net profit attributable to shareholders of listed companies will be 601 million yuan in 2018. To 660 million yuan, an increase of 7.25 times to 8.05 times. The performance of some stocks was reported to be lifted. Data treasure statistics show that12 of the bans released next week are expected to have a net profit decline of more than 30% last year.. The biggest decline isHaofeng TechnologyThe company expects a net profit loss of 600 million yuan to 700 million yuan last year, mainly due to the company's provision for impairment of goodwill formed by the acquisition of Beijing Luan Century Culture Development Co., Ltd.
Like Haofeng Technology,Ocean motor,Xinbang Pharmaceutical,Nanjing XinbaiIt is also expected that the net profit last year will be greatly reduced. Ocean Electric expects a net profit loss of 2.1 billion yuan to 2.3 billion yuan last year. Xinbang Pharmaceutical expects a net profit loss of 1.23 billion yuan to 1.35 billion yuan last year. Nanjing Xinbai expects a net profit loss of 960 million yuan to 1.36 billion yuan last year. A-share headlines: the 100 billion-level lifting of the ban, the Fed may go to cut interest rates?